Alice Walker is an American author, poet, activist and a self-proclaimed “womanist.” She was born in Eatoton, Georgia on February 9th, 1944, just before WWII ended. She was the eighth and last born child of Minnie Talluah Walker and Willie Lee Walker. Walker has worked as a social worker, teacher and lecturer and participated in the Civil Rights Movement that took place in Mississippi in the1960’s. Walker is well known for her novel The Color Purple, published in 1982, for which she won the Pulitzer Prize for Fiction in 1993. She is also an acclaimed essayist and poet. Alice Malsenior Walker, arguably one of the most admired African American women writers in the world today, grew up in poverty. Her father was a poor sharecropper while her mother worked as a maid. The environment she grew up in exposed her to violent racism and this left a permanent impression as depicted in her writing. In 1952 when Alice was only 8 years old, she suffered a serious eye injury. She was playing “cowboys and Indians” with her two brothers when she was hit by a BB bullet in her right eye. This injury blinded her right eye and disfigured her face slightly. This made her withdraw from the world around her as she felt ugly and disfigured. Her seclusion and reserved nature is what made her find solace in writing as she turned into an observer rather than a participator in the daily activities of life. Walker graduated from high school in 1961 and joined Spelman College in Atlanta, Georgia on a scholarship program. It is in Spelman where she started activism, participating in demonstration. Her efforts were recognized and in 1962 she was invited to Dr. Martin Luther King Junior’s home. This came as recognition of another invitation she had received to participate in the Youth World Peace Festival in Helsinki, Finland. She later joined Sarah Lawrence College on scholarship becoming one of the first young Africans to attend the prestigious educational institution. She graduated in 1965 and continued participating in the civil rights movement. She started by participating in door-to-door campaigns in Georgia, encouraging voter registration and then went to New York City where she worked in the city’s Welfare Department. Alice still found time even while pursuing civil rights. Her essay entitled The Civil Rights Movement: What Good Was It? won 1st place in the annual essay contest of The American Scholar. She was encouraged by this outcome and went ahead to register for a writing fellowship which she won to the prestigious MacDowell Colony in New Hampshire. Her life experiences formed a better part of her first collection of poetry. She proceeded to show her talents and this time round she chose to showcase her prowess in storytelling through her debut work, Third Life of Grange Copeland. She published several short stories in 1973 including, In Love and Trouble; a poetry collection, Revolutionary Petunias and her first book for children, Langston Hughes: American Poet. In the same year, Alice also emerged as a prominent voice in the black feminist movement. Alice Walker’s career as an author took flight with the publication of, The Color Purple, which is her third novel. The novel explores the female African-America experience through the life and struggles of Celie, the narrator. This compelling work won her several prizes including the national Book Award for Fiction and the Pulitzer Prize for Fiction in 1983. The story even made it to the big screen three years later, directed by Steven Spielberg. It starred the celebrated actress Whoopi Goldberg as Celie, alongside big wigs such as Oprah Winfrey and Danny Glover. 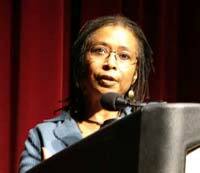 Alice Walker has several awards and honors to her name. This includes O. Henry Award for Kindred Spirits, The Rosenthal Award from the National Institute of Arts & Letters, Domestic Human Rights Award from Global Exchange and The LennonOno Grant for Peace.